​Ewin gaming chair is a relatively new name to us and this lineup of gaming chairs isn’t something we see on the market a lot, so we decided to take a look, get one and review it for your convenience. We love breaking in new chairs with long hours of stress testing. It lets us get a good feel of how well the chair holds up over time and how its comfort profile changes during use. Most of the time, we know what to expect, but there always comes a chair from an obscure manufacturer that’s just a little bit different. Even at first glance, this chair seems to fall into that category. I don’t quite know what I’m in for, but that isn’t going to stop me from getting to the bottom of this chair – metaphorically and physically. 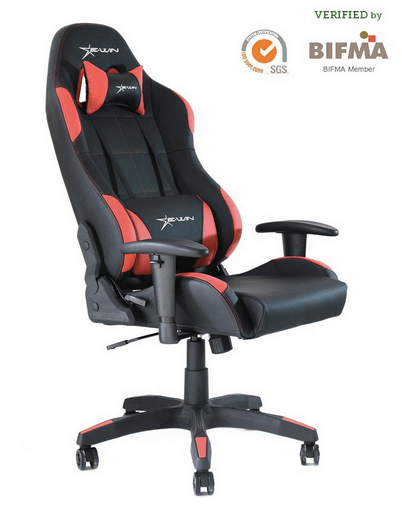 The Ewin Chair Champion Series Ergonomic Office Computer Gaming Chair with Pillows-CPD (Black/Orange) is a fierce but standard looking gaming chair for a pretty decent price as we feel the price isn’t too high and it’s not too low for someone’s budget. Ewin comes with all the standard functionality you’re used to seeing such as 360-degree swivel and tilt back. How does it hold up in terms of comfort though? Right off the bat, that large lumbar cushion just jumps right out at you. This is by far, the largest lumbar cushion that we’ve come across on a gaming chair. Most other gaming chair manufacturers include smaller cushions that are a little more firm than this. This one takes things a step further by including a large, plush lumbar support cushion that you can really lay in to. While I’ll admit that this is definitely a unique feeling cushion, after the first couple of minutes when the novelty wears off and the pillow is as compressed as it gets, it begins to feel very identical to all those other lumbar support cushions. This entire Ewin chair was designed around durability and comfort. One thing we noticed is that they put steel in areas that some other companies don’t, such as the armrests. The armrests are easily changeable but they’re highly resistant to wear, tear and the occasional arm pounding because they’re being supported with solid steel. The look of the Ewin gaming chair is quite fierce and we look the overall color scheme of white, orange and black. It makes for an attractive look, it should work in any room and it looks like it’s determined. It’s definitely a color scheme that grabs attention. There are a few design details that we aren’t quite as fond of, though. If you take a close look at the lower bucket grips on the chair, you’ll notice that the ergonomics are a little odd. The fins feel like they were designed to wrap around you for a snug fit – and while this is definitely a snug fit for the average person, it can get a little annoying if you’re even just a little larger. What makes things a little worse is that the fins themselves aren’t flexible, which means that you can’t even get them to budge if you want to pry them out of the way, like you would with some other gaming chairs. The Ewin Racing chair is an extremely durable chair. It’s one of the most durable we’ve ever gotten to test as a matter of fact. We tried numerous things that we don’t recommend you doing to see if we could get this chair to wiggle or cave under pressure. Nope, we couldn’t do it and this Ewin chair is extremely well built. They placed steel construction and materials in all the vital areas so not only will this chair last a really long time, you’ll have no issues with it, regardless of your weight. We really like the fact that the lumbar pillow lines up perfectly with the inner seam stitching job of the Ewin chair. It’s not something that a lot of companies go out of their way to do but they did a great job in providing comfort with this Ewin racing chair. It’s not overly expensive and the base we’d say is medium built which is more than adequate for most gaming chairs or customers. The armrests are easily adjusted and the free pillows included are soft and squishy to the touch, so when you lay your head down, you’ll almost feel like going to sleep. Something we thoroughly enjoy about Ewin gaming chairs is that they allow people to adjust the backrest to a comfortable decline position where they could even take a nap in. The backrest in this Ewin racing chair reclines up to a nice and comfortable 155 degrees. Sometimes, it’s just nice to lay back and take a nap in your favorite gaming chair. One thing we love about this Ewin chair and something we love about all gaming chairs who employ this kind of technology is the framework. We love when companies utilize steel frame in their gaming chairs because it’s something we wish we’d see more of. It allows for a lot more functionality and increases the durability by tenfold, so it’s one of those win-win situations. We love the steel framework and it really shows on the craftsmanship utilized in this chair. Another thing we love about the Ewin chair is that the armrests are adjustable so that you can fit them to your custom needs and you can make them catered to you individually, so you don’t have to be stuck with static armrests that you don’t like. Even the elbow shapes are adjustable so that if you don’t like them, you can easily remove or customize them until you do like them. Having PU leather in a gaming chair almost seems essential nowadays because a lot of people like to eat in their chairs and when they do, they’re prone to leaving crumbs and all other kinds of nasty things in their chair that can cause deterioration. With high-quality PU leather chairs, that means the chairs will be spill resistant and will be easy to wash if the need to wash them ever arises. Is this Ewin chair manufactured in the USA? No. This chair is manufactured in China but rest assured, the quality isn’t diminished and you shouldn’t have to worry about the quality, even though it’s not made locally in the USA. ​​I want the skull logo on a different color, is this possible? Unfortunately, the skull logo only comes on the orange color and this isn’t something we can change or even the manufacturer can change as they only offer that logo on their orange model. If you’re looking for a medium range gaming chair and something that won’t break the bank but will still keep you comfortable, look no further than the Ewin Chair Champion Series Ergonomic Office Computer Gaming Chair with Pillows-CPD (Black/Orange). 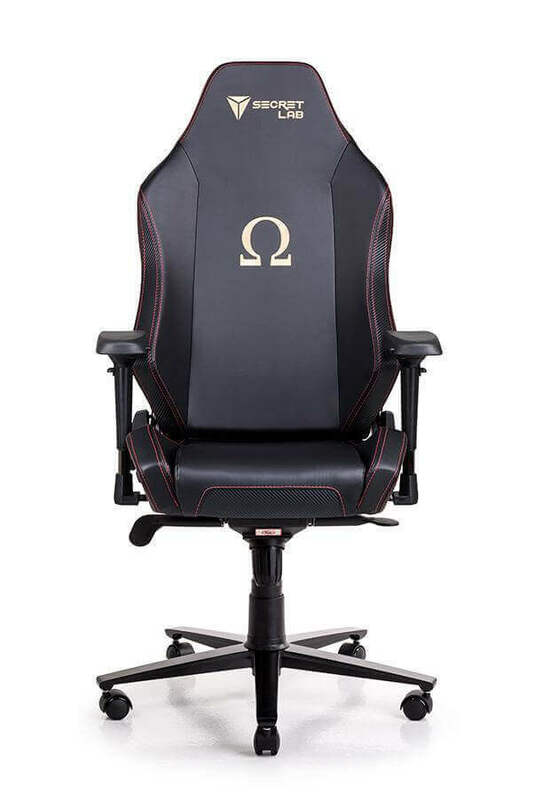 It has every kind of feature and functionality you want in a gaming chair and it does it without costing as much as DXRacer or some other high premium brands out there. This Ewin chair was more than comfortable enough for us and we’re sure that it’ll be more than comfortable enough for you as it feels soft to the touch and is great to sit on.